The Starburst Color Shot Set from Lindy's Stamp Gang has deep, rich, vibrant colors with a two-toned shimmer finish. 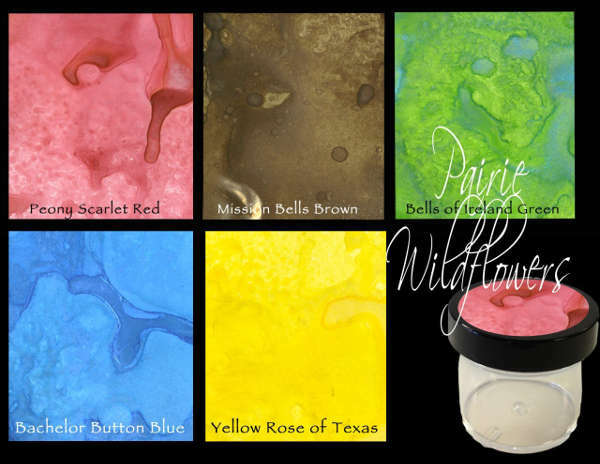 These color washes are dye based products which gives them that vibrancy and can be used on any porous surface including paper, wood, fabric, balsa, chipboard, etc. These can be mixed with any medium (not just water), which includes modge podge, rubbing alcohol instead of water (faster drying time), acrylic glaze, etc. Each set includes five, wide-mouth 2 oz. jars, which is great for dipping and painting. Starburst Color Shots are shipped dry with powder only. Before using, as per manufacturers guidelines, you will need to add hot water to the fill line on each jar and let sit for 10 minutes.